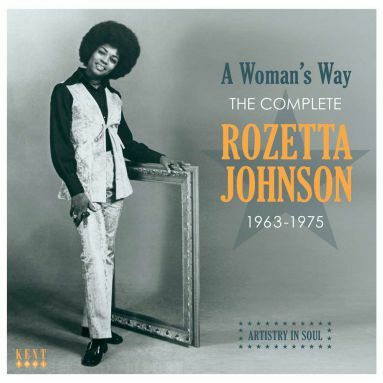 Birmingham, Alabama singer Roszetta Johnson created marvellous southern soul, particularly when collaborating with songwriter Sam Dees, also from that city. (Note the spelling of her name; her records were usually issued as by Rozetta or occasionally Rosetta.) This CD features all her known recordings from the 60s and 70s; only some much later CD tracks are absent. Her extremely scarce 1963 single for NRC was an accomplished live recording of the standard ‘Willow Weep For Me’. The flip, ‘I Understand My Man’, written by bandleader John Hayden, also demonstrates Roszetta’s already considerable talent. In 1965 she switched to the Jessica label with two more Hayden compositions: the pop-soul ‘That Hurts’ and the exceptional ballad ‘It’s Nice To Know You’. Atlantic Records picked up the single for national release. A five-year hiatus, which included much live work around Alabama, ended when Roszetta signed with the Moonsong/Clintone set-up. She scored R&B hits with her first two releases: ‘A Woman’s Way’ and ‘Who Are You Gonna Love (Your Woman Or Your Wife)’, both written and produced by Sam Dees. Her next four discs did not chart but contributed to a body of work of which any soul singer could be proud; not for nothing did Dave Godin include ‘Who Are You Gonna Love’ in his “Deep Soul Treasures” series. We discovered the epic ‘I’ve Come Too Far With You (To Turn Back Now)’ when researching the Clintone recordings in the 90s. ‘Mama Was a Bad Seed’, ‘You Better Keep What You Got’ and ‘For That Man Of Mine’ first surfaced on a Soulscape CD in 2007. Subsequently we found a longer version of ‘I’ve Come Too Far With You’ with an alternate vocal and ‘I Can Feel My Love Comin’ Down’ with previously unheard backing vocals and an alternate lead. The version of ‘Mama Was a Bad Seed’ here has added instrumentation, while ‘You Better Keep What You Got’ is longer, with improved audio. Roszetta’s songs are as popular as ever among the cognoscenti. Finally her complete soul era recordings are available on one disc.